You may purchase Greek for the Rest of Us online from ChristianBook.com or from your local bookstore. You may download the Table of Contents and Preface. Foundational Greek: Learn enough Greek to make sense of a Strong's Bible, such that when you do mouse overs in software, the information shown makes sense. Greek word studies are covered in this first section. Church Greek: Learn more about Greek so that you can intellignetly use reverse interlinears. For most people learning Greek in a church context, this completes what they need to know to go much deeper in their Bible study. Functional Greek. Learn even more Greek so that you can use traditional Greek-English interlinear. This section has the most Greek grammar and requires the most homework, but when done you should have total functional use of any reference tool available. Greek for the Rest of Us cover two years of Greek grammar, the normal amount taught in seminaries. You should be able to do anything a seminary-trained person in traditional Greek can do (except for reading Greek without software). There is an online class that parallels the textbook, including significant amounts of helps such as vocabulary and homework exercises. There are video lectures (for purchase) that cover the entire textbook. 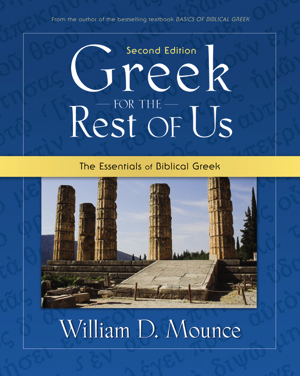 Greek for the Rest of Us, the second edition of renowned Greek teacher William Mounce’s widely used resource, teaches the essentials of biblical Greek and how to use more advanced Bible study tools. Greek for the Rest of Us is ideal for the beginner and even for those with a seminary education.